Associated Engineering Company (AEC) was a manufacturer of heavy vehicle chassis based in England and first saw success with the Matador Tractor, used to tow artillery pieces and anti-aircraft guns in the field during World War Two. The successes of the Matador chassis lead to the development of an armored car to try and match firepower and protection of the tanks currently in service at the time. 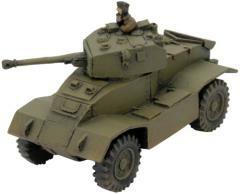 The AEC Mk I carried a Valentine turret armed with a 2pdr gun and saw action in North Africa during late 1942. The Mk II introduced a 6pdr gun housed in a heavier turret and also featured a redesigned front hull. The final version, the Mk III saw the main gun switched to a 75mm gun, a copy of the American M3 75mm tank gun used in the Sherman. This aided in its ability as a support vehicle to other armored cars during its service in Northwest Europe. The improvements to the AEC Mk III makes it a valuable support vehicle. Its 75mm gun has the ability to deal with enemy tanks and dug in infantry. Furthermore, the AEC Mk III can lay down smoke and provide valuable concealment to your advancing units.